As one of the busiest train stations in the world and headquarters to Amtrak, Union Station in Washington DC is home to an abundance of shops, restaurants, entertainment venues and more. Its location in the center of downtown DC makes it an ideal starting point for touring the city’s many historical sites, attractions and other activities. Union Station is just the beginning! A venture to these other Washington DC sights and attractions will make for the ultimate travel experience. The spectacular Union Station was originally designed to be the gateway to the city and since it opened over 90 years ago, has become the most visited site in DC. Its unique architecture makes it popular for photos. Locals, tourists and even Presidents make it a point to visit this magnificent historic mall and train station. Two levels feature over one hundred fabulous stores and offer shopping of every kind, from clothing to jewelry, gifts, toys, souvenirs and more. Snacks, treats and casual meals are available in the food court and several other restaurants provide delicious international fare. There’s also a nine-screen, state-of-the-art cinema on the lower level. Various cultural events and exhibits are held at Union Station throughout the year, attracting guests from around the globe. With more than 25 million people stopping in to browse, shop or just experience the excitement at Union Station each year, it still acts as the gateway to our nation’s capital. Journey back to the days of the Pony Express and see first-hand how the mail was delivered in colonial America, through times of war and into the present day. At the Smithsonian National Postal Museum, visitors learn about the amazing history of the American postal service and how it evolved to become what it is today. Located on the lower level of the old Post Office Building just next door to Union Station, the building was constructed in 1914 and served as the Washington DC post office until 1986. Today, visitors from around the world come to learn about the role the postal service has played in shaping our country. Six galleries offer interactive, engaging exhibits including three airmail planes flying overhead, a railway car and a stagecoach. Thousands of stamps, postal artifacts and historic displays are also a main attraction. And if that’s not enough, there’s a museum shop and stamp store. Explore, discover and admire the significant lifeline of our nation’s postal service; it’s a memorable stop during your visit to Washington DC. People of all ages get a special thrill when they visit the renowned Smithsonian National Air & Space Museum. As the biggest of all the Smithsonian Museums, you can view the largest collection of historic aircraft and spacecraft in the world. There are more than 60,000 objects including rockets and jetliners, gliders, spacesuits, space helmets and much more. From massive aircraft to tiny microchips, many of the items you’ll see are one-of-a-kind and associated with a momentous milestone in aviation history. For art enthusiasts and anyone who enjoys viewing masterpieces, this art museum is a must-do while you’re close by. The collection encompasses everything from paintings and drawings to prints, photographs, sculpture, medals and decorative arts. Visitors can even browse works from the Middle Ages to the present. Here, you’ll also have the opportunity to view the only painting by Leonardo da Vinci in the Americas. For adults and children alike, there’s no sightseeing experience quite like the one DC Ducks provides. The tour takes place on an amphibious vehicle that was used to transport supplies to American ships during World War II. The thrill begins the moment you board this unique tour bus that’s also a boat! It will transport you past the sites first through the city streets, then plunge right into the Potomac for a view from the water. DC Duck tours depart daily from Union Station. A unique way to view many of the most popular monuments in DC, this special tour takes place at sunset and departs from Union Station. On board, you’ll see the Iwo Jima Memorial, FDR Memorial, Lincoln Memorial, Vietnam Veteran’s Memorial, Korean War Memorial and the Martin Luther King, Jr. National Memorial. Your on-board guide will share some of the fascinating history of the sights you’re seeing as well as the city of Washington DC. Enjoy lighthearted historic tales about the Curse of the Hope Diamond and more as you travel down the same streets that American Presidents, dignitaries and world leaders have also traveled. Less than a mile from Union Station, the International Spy Museum is the only museum of its kind in the USA and an extraordinary way to spend a few hours while in DC. Here, you can learn the intriguing history of spying and espionage and see a vast collection of spy gadgets, weapons and artifacts, many of which are being seen by the public for the first time. Explore this unique museum and enjoy interactive exhibits as well as discovering fascinating facts about some of the world’s most famous, and infamous, spies. A part of the Smithsonian Institution, the National Portrait Gallery features the country’s only complete collection of presidential portraits besides the White House. Among its exhibits and collections, you’ll have the opportunity to view an array of remarkable art pieces that include busts, paintings and drawings that portray the people who have made and are making an indelible impression on the United States of America. 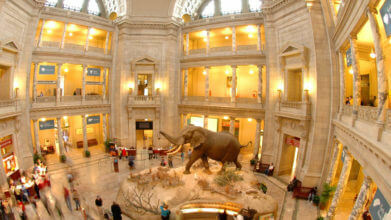 Located within the Old Patent Office Building, the museum is just a short walk from Union Station. An iconic structure that symbolizes freedom and justice in the USA, the Supreme Court was built in 1935 and heard its first case in October of that same year. An architectural masterpiece, the building itself is something not to be missed. Inside, you’ll wonder at its ornamental design marble staircases and various art pieces including a statue of John Marshall and busts of Supreme Court justices. Visitors are able to take self-guided tours of the building and sit in on a court session. Old Town Trolley is a convenient way to explore Union Station while maximizing your vacation time. Let us guide you around one of the busiest train stations in the world, where you can also enjoy the many attractions, such as the Smithsonian National Air and Space Museum, or the International Spy Museum. With stops throughout Washington DC, you can hop on and off at the sites you want to visit and learn about the rest during our fully narrated 90 minute historic sightseeing tour. Find the lowest price and money-saying packages by purchasing tickets direct through our website.